Wild Wishes is another game that’s shamelessly based on Disney’s Aladdin. That said, it is one of the best additions to the ever-popular slot theme. The symbols and background are suspiciously close to the original content, and the genie even makes an appearance. 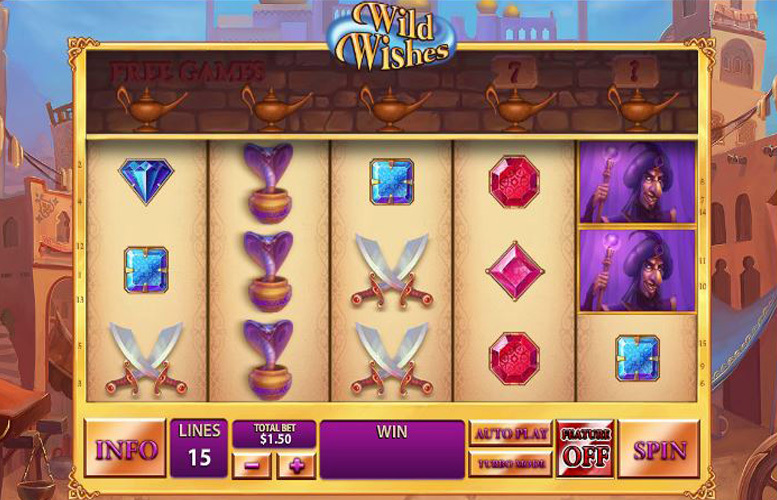 Wild Wishes isn’t just a looker though, it also has some great bonuses to boot. The lamp re-spin dynamic that leads to free spins happens to one of our favourite bonus features we’ve seen to date. Great bonus features with rarely seen elements such as additional rows for free spins and consecutive re-spin awards. Nice theme. It’s a shame Playtech didn’t obtain a license to make this an official product but since Aladdin is a Disney product, it’s understandable that the children’s entertainment behemoth doesn’t want their characters appearing on online fruit machines. Very low betting limits. 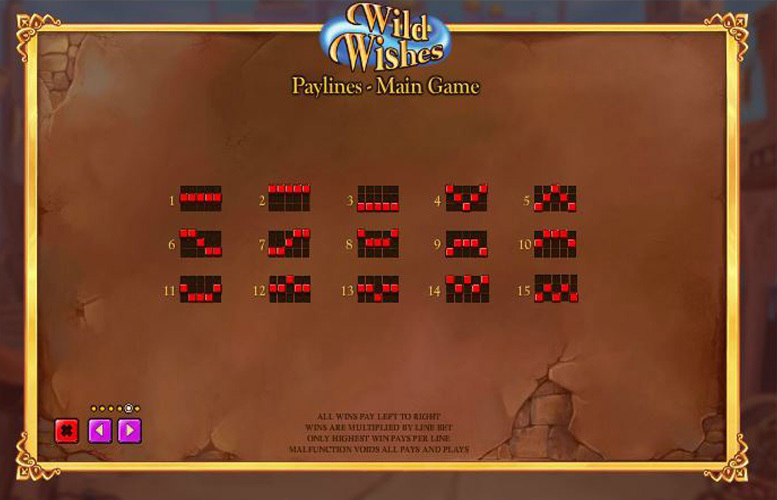 The Wild Wishes game features a maximum total bet of just £90. Whilst this is more than enough for the average user, it’s a low figure especially when considered that many virtual machines allow bets of £2,000, or even £5,000 per spin. Aladdin or “wild” genie = 750x the line bet. Jasmin or Jaffar = 300x the line bet. Snake, or Swords = 150x the line bet. 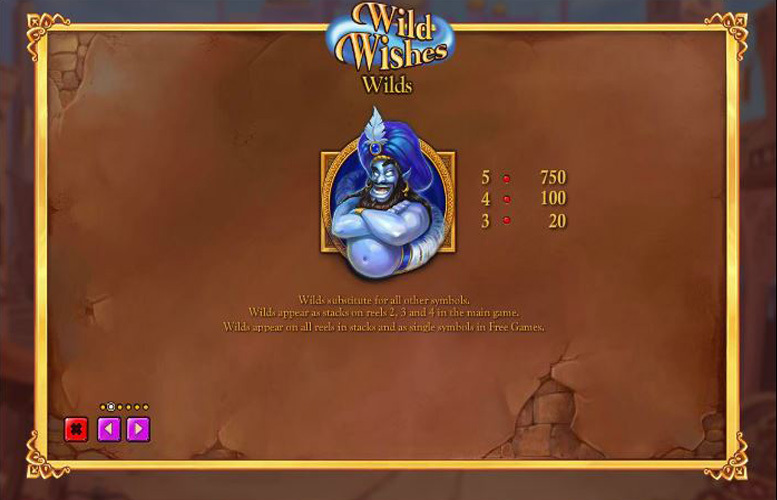 The Genie “Wild” symbol substitutes for all other symbols in the Wild Wishes game. It appears as stacks on reels two, three, and four during the main game, and all reels during free games. Any win during the main game lights up a lamp on the row above the reels and awards a free re-spin. Wins during a re-spin will light up another lamp and award another re-spin up to five consecutive times. Players who are fortune enough to hit four consecutive wins will be awarded with seven free games, and five wins on the trot win 8, 10, 15, 20, 30, or 50 free games. The Feature Bet button activates/deactivates the Feature Bet mode. Activating it increases the total bet by 10 coins for every 15 coins bet. Using the Feature Bet mode lights up the first lamp on the top row. This means that players only need three consecutive wins to trigger free games. The Free Games feature is triggered by lighting up four or more lamps. When the Free Games feature is triggered, the row of lamps is removed to reveal an extra row of symbols and 25 additional pay lines. A cloud of smoke is released from the lamp during every Free Games spin. The smoke cloud will cover several positions on the reels. If a “wild” symbol lands in one of the reel positions covered by smoke, every symbol in the cloud will turn “wild”. This can make for some absolutely massive returns. Red gem = 100x the line bet. Pink gem = 75x the line bet. Purple gem = 75x the line bet. Either blue gems = 50x the line bet. Owing to some of Wild Wishes bonus features, the number of win lines is fixed at 15. The only thing that players can adjust in terms of their betting limits is the total bet which ranges between 15p (1p per win line), and £90 (£6 per win line). Clearly, Wild Wishes wasn’t designed with the highest rollers in mind. 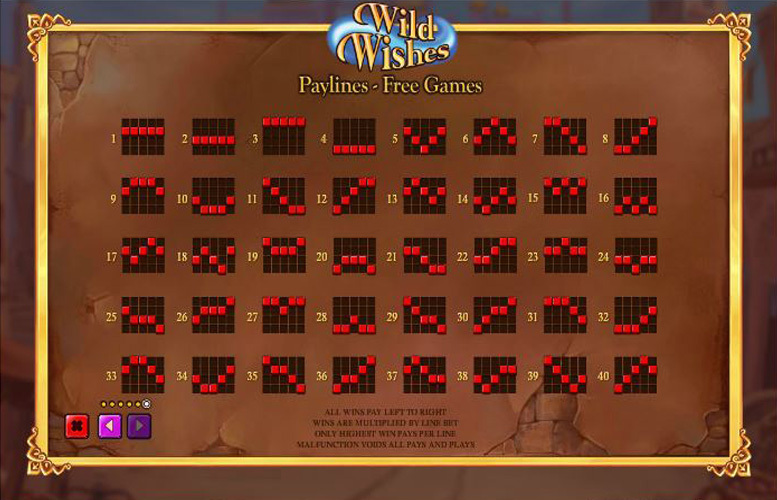 For all intents and purposes, Wild Wishes might as well have the name Aladdin. The artwork, music, characters, and bonus features are all more than just inspired by the Disney classic, they’re straight up based on it. If the children’s entertainment giant were to suddenly start licensing slot machines, we’re pretty sure the Aladdin title would look just like Wild Wishes. The game sores highly for us not only because of its strong visuals but thanks to its creative approach to bonus features. There are several, and they’re much more innovative than the standard “free spin” and “pick-a-box” style side games on many modern machines. This game has a rating of 9 / 5 with 327 total reviews by the users.